In this case, I was contacted by a gentleman you may have read by the name of C.J. 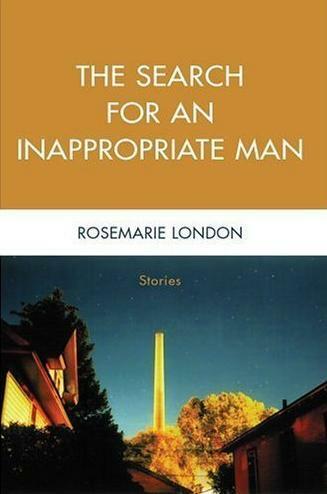 Box (fellow Putnam stable mate and author of OUT OF RANGE and TROPHY HUNT), who recommended (highly) today's pick: THE SEARCH FOR AN INNAPROPRIATE MAN by RoseMarie London. When it comes to collections of short stories, I tend to be overly picky. In fact, I would suggest it is more difficult (in some ways) to write and develop a group of characters and plots than one cohesive set. Difficulty aside, RoseMarie London executes with precision here. This collection is beautiful, funny, poignant. Her writing is that of a proven veteran, incredibly sharp--all the while keeping her phrasing catchy and interesting--and the stories moving smooth and steady. She has a tight grasp on human emotion and knows how to deliver it in her prose. I'd lived in Wyoming for five years before I got shot standing beside the wrong man at the wrong time next to a pool table in a bar where, up to that moment, it looked as though I was going to walk away from a win that would clear my tab. It was some crime of passion--not mine--I paid for with a bullet through the shoulder. In my estimation it probably makes up for all the passionate misdeeds I'd gotten away with. Karma's funny that way, it seems. I don't remember the commotion that followed the through and through. There was less blood and less pain than I would have otherwise thought. And I didn't fall right away to the ground. Women are always in pain; I perpetually experienced a tightness in my chest, or what felt like a fist between my shoulder blades, or a stitch in my side to follow some thought or another I shouldn't have been thinking. The fist. I thought that's all it was. The short stories here cover everything: love and loss and regret. But we're talking Wyoming, for the most part. And a lot of horses. I plowed through this book in a matter of hours and immediately read through two of the stories again. My only complaint is that it is 106 pages. I could have easily absorbed another 200. On the other hand, it is only $9.95. Let's hope Ms. London has a novel or two under her belt. Friday Morning Burnt Toast, Dry.